Amtrak P42s #36 & #182, in Phase V livery, lead their Superliners from siding storage before heading east. 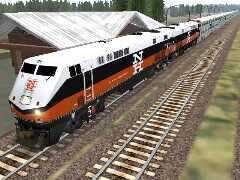 On 26-Mar-02, the designer team at NALW (North American Locomotive Works) released their Genesis Pack of Amtrak P40 and P42 locos at Train-Sim.com. 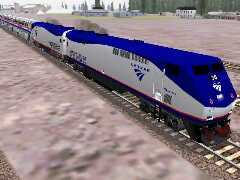  (30-Mar-02) update: P32ac set made available by NALW at Train-sim.com, in Gen Pak3. p42set.zip (24-Feb-02): version 1 of P42 loco set in Phase III, IV, V liveries. gen_pak2.zip (3.4Mb, 26-Mar-02): P42 Genesis Phase III, IV, V locos, custom cab and sounds (requires gen_pak1). 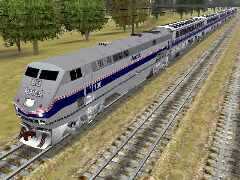 gen_pak3.zip (10Mb, 28-Mar-02): P32ac Genesis/AMD110, in Amtrak, New Haven, Metro Northern & CommDOT liveries. Custom cab and sounds, requires gen_pak1. opt_pak.zip (2.3Mb, 24-Mar-02): updates default Genesis to Phase II livery (only contains necessary bitmap files). If you haven't installed earlier versions of Genesis locos, just get going with installing NALW's latest work. Otherwise, here's a few tips to delete the old versions, then install the latest and clean up some consists with ConBuilder to keep MSTS running happily. Amtrak Genesis P42 #106, in the Phase IV livery, leads a consist of Superliner passenger coaches. Firstly, go to Windows Start, Settings, Control Panel, Add/Remove Programs to check for any P42 uninstallers. From memory, webWiz only found an uninstaller for the P42 cab and he ran that because the new Gen Paks have custom cabs included. delete the P42_amtk folder which contains version 1 of the P42 set of 14-Feb-02. webWiz had a subfolder called P42-Gen under his Common.Cab folder; he renamed this as P42-Gen-old until he saw what happened with the installation of the Gen paks. It's ok to delete it; wait until everything is installed if you're at all worried (post-installation comment). It's now ok to extract the installation EXEs from the Gen paks, virus check them, and run them to get NALW's locos installed. Using (Windows) Explorer, you'll see you have NALW_P40, NALW_P42 folders, a P42 subfolder in Common.Cab and a Genesis subfolder in Common.Snd. Now comes the messy bit - we have to check all the consists that have been using our "old" versions of the Genesis locos. Update 03-Apr-02: webWiz found after installing the Gen Paks that his default Genesis ENG file had gone missing (MSTS reported a missing Genesis ENG file when starting an activity). This probably happened after carrying out the above steps to remove "old" Genesis updates and versions. As instructed in one of the "readme" files for Genesis updates, he had made a backup of the default Genesis folder and the problem was easily fixed. To read more about how you should set up a folder for MSTS backups, see Preparing for downloads. New Haven P32ACs, in charge of a set of Metra bilevel coaches, let their passengers wonder at the view across the Java West bridge. We'll have to check consists, particularly any which have been installed on our system when we've unpacked activities. We haven't got time to do it by hand, so we use ConBuilder. Start up ConBuilder, choose Program, Test units. Choose Test all units from the next screen and hit the big button. ConBuilder, after a minute or two, will give you a list of missing locos and the consists in which these locos need replacement. Now it's just a matter of loading each consist into ConBuilder's consist editor and replacing any "old" AMD103, Genesis or P42 loco with one of NALW's new ones. They'll all be listed in ConBuilder's engine list as "P40..." or "P42...". If you had version 1 of the P42 set installed, be careful not to get tricked by ConBuilder showing what appears to be the updated P42 version locos in any consist. You may need to check your consists a couple of times, but after a little bit of editing, everything will be OK - MSTS will be happy and behave itself. Fire up those Genesis locos - enjoy! If you've installed RC-Lite, you could use it to check your consists. However, webWiz likes ConBuilder because you can simply send off any offending consist to the editor and make your substitions. ConBuilder incorrectly scans the string in the Name parameter of the ENG file and halts at the right-hand bracket enclosing the E (for electric 3rd rail). You can easily fix this by using WordPad to edit each electric 3rd rail ENG file by scrolling to the Name parameter, found near the end of each ENG file and taking out the brackets around the E.
New Haven P32ac #228 & #229 at the head of a set of Metra bilevel passenger cars at Glacier Park. webWiz tried the P32ac, in New Haven livery, with the NH Merchant Ltd passenger car set straight after installation to see how it performed. After releasing the train brakes, it took a couple of minutes for the compressor to recharge the system. Until that happened, the brakes remained on. After changing to Metra bilevel passenger cars, the brakes recharged far more quickly. From webWiz's experience of his only ride in the cab of a loco, thus far, at the head of a passenger consist, it seems that, for older type carriages, the engineer releases the train brakes a few minutes before departure time. The loco brakes remain on. When the driver gets the all-clear from the conductor, the loco brakes are released and the train moves off. This makes sense, since air brakes work on the principle that the compressed air's function is to keep the brake shoes off the wheels. If there's no pressure in the system, the brake shoes remain on the wheels, even when we've "released" the brakes.